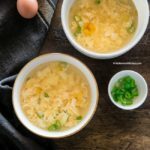 Super easy Korean egg drop soup recipe! 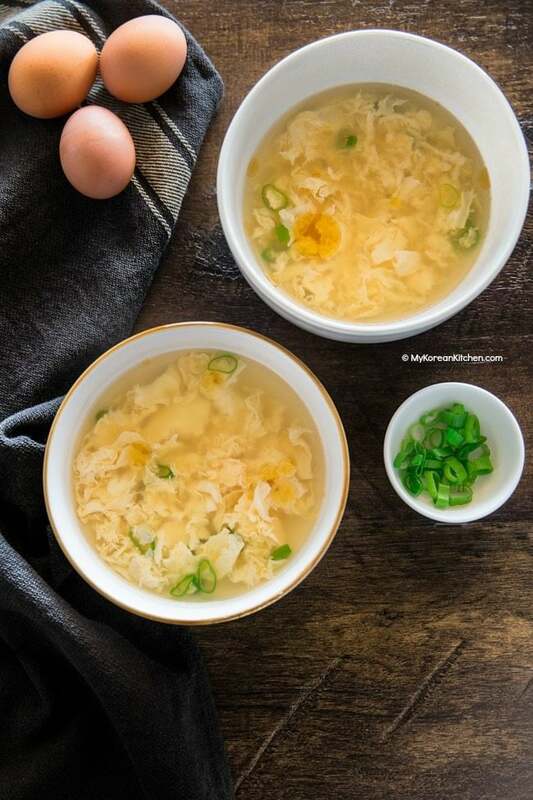 Learn how to make Korean style egg drop soup, Gyeran-guk (계란국), at home. It’s so delicious and comforting! It tastes light, healthy and savory. And the nutty aroma from a small drop of sesame oil gives you a warm and cozy feeling. What’s more, it’s very easy to make! Just follow my simple 2 step instructions! Korean egg soup (Gyeran-guk) is a staple Korean soup. Anyway, the egg soup is a great soup to make when you’re in a rush, because it’s very easy and quick to make and the required ingredients are readily available at home. The soup tastes savory, mild, nutty, and warm, so it is great for people who can’t tolerate spicy food well such as young children. 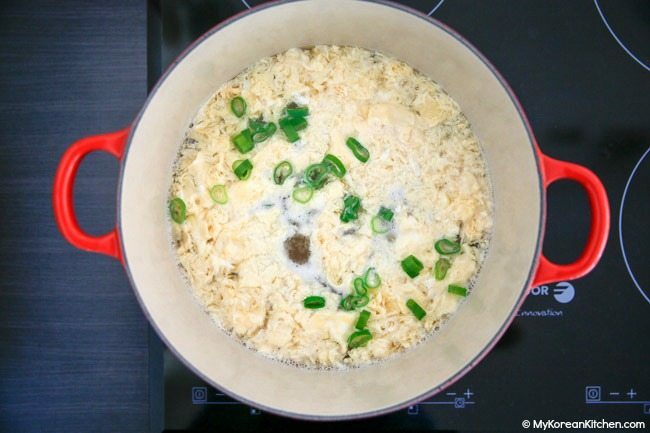 Unlike Chinese style egg drop soup, which is often made with chicken stock, Korean egg drop soup is made with dried anchovy stock and/or dried kelp stock. Though I can’t clearly compare the taste difference between these two soup as I don’t eat Chinese egg drop soup often enough to notice. Anyway, I hope you give this Korean version of egg soup a try soon. Enjoy! P.S. If you like this recipe, you might also like to try my Korean steamed egg (gyeran jjim) recipe. It’s a very popular Korean side dish. 1. Pour the dashi / soup stock in a sauce pan and add the soy sauce and the salt. Boil it over medium high heat. 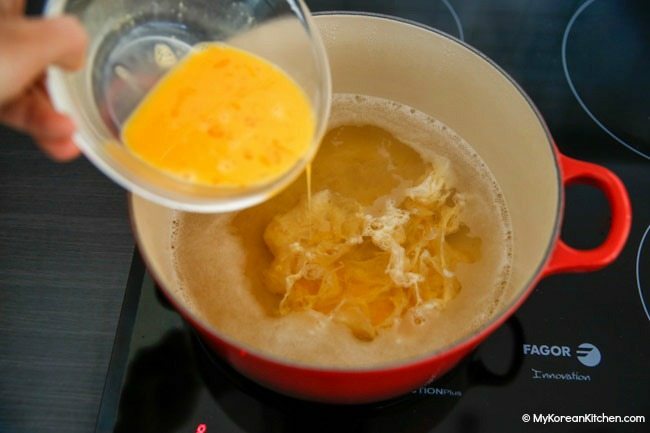 Once it’s rolling boiling, reduce the heat to medium and drizzle the beaten egg into the pot. Let the eggs set for a few seconds then stir it gently to break up the egg. Boil it further 1 min then add the the green onion. 2. Scoop out the soup into a bowl. Add a drop of sesame oil (about 1/8 tsp per bowl). Serve it warm with steamed rice. Pour the dashi / soup stock in a sauce pan and add the soy sauce and the salt. Boil it over medium high heat. Once it’s rolling boiling, reduce the heat to medium and drizzle the beaten egg into the pot. Let the eggs set for a few seconds then stir it gently to break up the egg. Boil it further 1 min then add the the green onion. Scoop out the soup into a bowl. Add a drop of sesame oil (about 1/8 tsp per bowl). Serve it warm with steamed rice. Finally, i stumbled on a good Korean kitchen. Great soup! Is this an error? 4.5 cups of anchovy dashida? I didn’t use dashida. I used soup stock / yuksu / dashi made with dried anchovy and dried kelp. I already put the relevant recipe link in the ingredient section above, but in case you missed it, I will put it up again. https://mykoreankitchen.com/how-to-make-korean-style-dashi/ Hope this clears your question. Wow, I never knew there was a Korean version of egg drop soup! I also never knew it was such an easy dish to prepare. Would it be okay to sub Japanese dashi stock in place of the Korean dashi (I always have the former in my fridge, so it’d be more convenient)? It’s just homemade Japanese dashi – kombu + bonito flakes. I thought you were talking about something like hondashi. 🙂 Shannon, I think your dashi might work. Kombu is same as dried kelp I used. But Bonito flakes may give you a bit stronger flavor. Just watch out for that. (While uncommon, I’ve seen some Koreans making egg soup with bonito flakes.) Let me know how you go!